Paul Cook admits Wigan Athletic will face the toughest test yet since returning to Championship over the coming week. 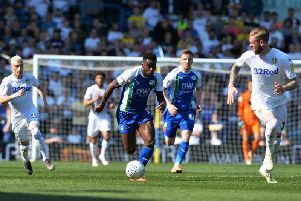 After a fortnight off for the international break, Latics return to action on Saturday afternoon at Brentford for the first of three matches in the space of just six days. Hull City visit the DW next Tuesday before Bristol City roll into town next Friday for a Sky-televised game. And Cook – managing for the first time in the second tier – admits it’s all part of a steep learning curve both for the team and for him as a manager. “It’s been different, for sure, being a manager who hasn’t managed at this level, dealing with things like this before,” Cook acknowledged. “To have a break like this I’ve found strange, if truth be known. “Some clubs go away, some clubs keep it the same...and whatever you do, you feel like it’s getting away from you. “But that’s the modern day, and you have to adapt. “I’ll buy into it eventually...don’t worry about that! Latics don’t even have the luxury of easing themselves back in, with two more big games on the way next week. “After two weeks off we’re going to play three games in six days...and that’s what you struggle with,” Cook recognised. “And that’s why people say the Championship is a grind and everything, and you just have to get on with it. “You have highs and lows, and you just have to roll with it. “You get nights like Stoke where you come away thinking you’re going to win the league, and afternoons like QPR when you come away thinking you’re going to be relegated. “And that was all within the space of three or four days! Not that Cook begrudged any of his players – including Will Grigg, Sam Morsy and Antonee Robinson – from going away and making their mark on the international stage. “It was great for us to see so many players going out to different places with their national teams,” he added. “It’s good and bad - because while you’re happy to see them get recognition, you also have that worry about injury and fitness issues. Latics could hardly have picked a more difficult game first up, with Brentford among the favourites for promotion to the Premier League. “You could not speak highly enough of Dean Smith and Brentford, and what goes on down there,” Cook enthused. “They are very serious candidates for play-offs and promotion, despite not being one of the ‘big’ teams. “But having said all that, we have to go down there and try to win. “Everyone who knows me knows we will be doing our very best to do that. “You’ll see two teams determined to have a go at each other, and that normally bodes for a good football match. “We’re well aware of the threats they’ll pose, but we’ll also pose a big threat that they’ll be worried about.